The following special trains will be run to clear the extra rush of pongal 2016 return. 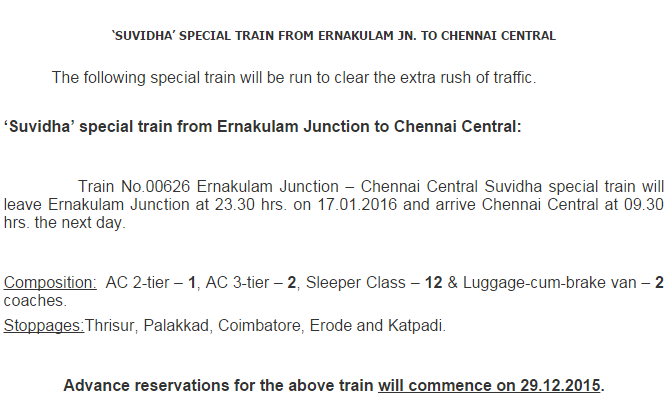 Train No: 00626 Ernakulam Junction to Chennai Central Suvidha special train will leave Ernakulam Junction at 23.30 hrs. on 17-01-2016 and arrive Chennai Central at 09.30 hrs. the next day. Train runs via : Aluva, Thrissur, Palakkad, Coimbatore, Tiruppur, Erode, Salem, Jolarpettai, katpadi and Arakkonam.